Thin-bed reflectivity can be used to boost up the frequency content, by flattening the frequency spectral of the input seismic data, or by extending its bandwidth in an amplitude friendly way, and extract more information from it. Another useful application is while performing simultaneous inversion, where the near-, mid- and far-angle stacks are input into the inversion. As the frequency content of these stacks are different, the inversion suffers when they are used as such. What we have been demonstrating to our clients in recent years is that when these input angle-stacks are frequency balanced and then input to simultaneous inversion, the resultant P-impedance and S-impedance attributes exhibit higher resolution. We highly recommend this application. The workflow for thin-bed reflectivity inversion entails the extraction of time-varying wavelets from the input seismic data, and the using the principles of spectral inversion, the effect of the wavelets is minimized in that a high-resolution reflectivity volume is extracted. This volume shows the reflectivity extracted from the input data. It is generally used to look at the fine detail not usually seen on the input seismic data. At times it helps understand subtle features that are not seen on the input data due to its poor bandwidth. So the volume should be used to examine the reflection detail. The figure below shows a segment of a seismic section and its equivalent derived reflectivity. The output of the inversion process can be viewed as spectrally broadened seismic data, retrieved in the form of broadband reflectivity data that can be filtered back to any bandwidth that represents useful information for interpretation purposes. Thin-bed reflectivity serves to provide the reflection character that can be studied, by convolving the reflectivity with a wavelet of a known frequency bandpass. This not only provides an opportunity to study reflection character associated with features of interest but also serves to confirm its close match with the original data. The figure below shows a segment of a seismic section, its equivalent derived reflectivity and the derived reflectivity with a wavelet of a higher bandpass. 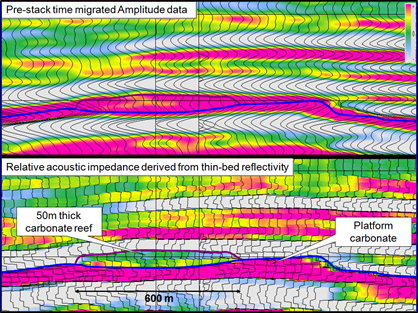 Instead of correlating the tops and bottoms of formation boundaries on seismic reflection data, with the well logs, relative acoustic impedance allows us to interpret reflection isochron units as individual formation thicknesses which can be clearly correlated with logs. Even though the impedance values are not absolute, relative impedance is a useful attribute. It may be noted that the relative acoustic impedance is run on the thin-bed reflectivity (which does not have the wavelet on it anymore), and so yields more accurate information. The figure below shows a segment of a seismic section and its equivalent relative acoustic impedance run on thin-bed reflectivity inversion. Notice the reef has a poor seismic response on the seismic, even though it is producing gas from the two wells marked in the figure. On the relative acoustic impedance, it shows up nicely.